Learn to setup a Particle Device to Send/Retrieve data to/from Ubidots using the Ubidots Library with the Particle Build IDE. 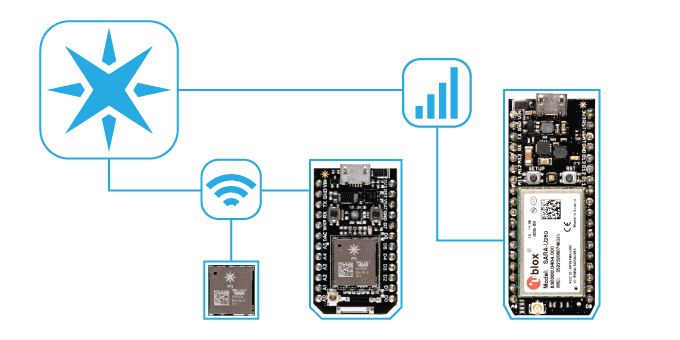 Particle devices are compact and easy-to-code hardware development kits that provide everything you need to build cloud-connected projects. Particle combines an ARM micro-controller, a communication chip (WiFi, GPRS or 3G) and a web IDE with tons of community examples and libraries to make your development with Ubidots as simple and efficient as possible. This tutorial explains how to interact with Ubidots REST API using Particle. – Particle Electron: Follow this steps to set up the Particle data plan. Particle Electron steps. – Particle Photon: You can setup your Particle Photon either Using your smartphone or Connecting it to your computer over USB. In the Particle Build Web IDE, create a new app. For additional details in how to "Create New App," simply click here and follow the simple 3 step process. NOTE: We titled this guide's project "Myapp". Whichever name you select, you will need to refer to the same name throughout your project. Whenever you see "Myapp," know this is a reference to your Particle IDE application. Click on "INCLUDE IN PROJECT". Select the project to include the library in. In this case "Myapp". 2. Ubidots Library: HTTP, TCP and UDP Protocols. Ubidots' library for Particle devices is a light-weight firmware that utilizes in-code Instance Declaration and Protocol Selection with standard method invoking to either Send/Retrieve data to/from Ubidots. Using one of the instances and protocols above, your device is authenticated with Ubidots cloud using the UBI_TOKEN (TOKENS) and select the method to communicate using one of the flags UBI_HTTP, UBI_TCP or UBI_UDP. For additional information about Ubidots library for Particle devices refer to our GitHub repository. In the below examples you'll find sample codes to integrate to Ubidots from Particle Devices through the mentioned protocols mentioned above. Following the below steps you'll be able to send data to Ubidots through any of the protocol supported by the library: HTTP, TCP, or UDP. Step 1: Copy and paste the below code in your "Myapp" project. Step 2: Enter a valid TOKEN from your Ubidots account. Step 3: Choose Protocol by comment/uncomment the appropriate instance. Step 4: Uncomment line 36 if you want to see debug messages on the serial monitor. Step 5: Change the variable labels on lines 43, 44, 45 as needed. Step 6: Verify the code. Step 7: Flash the code to your Particle devices. Step 8: Check your Ubidots account. // Ubidots API through HTTP, TCP or UDP protocol. Ubidots ubidots(TOKEN, UBI_TCP); // Comment this line to use another protocol. //Ubidots ubidots(TOKEN, UBI_HTTP); // Uncomment this line to use HTTP protocol. //ubidots.setDebug(true); // Uncomment this line to print debug messages. ubidots.add("Variable_Name_One", value1); // Change for your variable name. Following the below steps you'll be able to send data with context to Ubidots using any of the protocol supported by the library: HTTP, TCP, or UDP. Step 1: Copy and paste the below code on "Myapp" project. Step 5: Change the variable labels on lines 52 as needed. //Ubidots ubidots(TOKEN, UBI_UDP); // Uncomment this line to use UDP protocol. //ubidots.setDebug(true); // Uncomment this line for printing debug messages. Following the below steps you'll be able to send data with timestamp to Ubidots through any of the protocol supported by the library: HTTP, TCP or UDP. Step 5: Change the variable labels on lines 43 as needed. // to a variable to Ubidots API through HTTP, TCP or UDP protocol. Following the below steps you'll be able to send data with GPS Coordinates as context to Ubidots through any of the protocol supported by the library: HTTP, TCP or UDP. Step 5: Change the variable labels on lines 65 as needed. Following the below steps you'll be able to retrieve data from Ubidots using HTTP or TCP. IMPORTANT NOTE: UDP Protocol does not support retrieving data since this protocol is only meant to forward messages from client to server. Step 4: Uncomment line 33 if you want to see debug messages on the serial monitor. Step 5: Enter Device and Variable Label on line 38 to retrieve last value from. // This example retrieves last value of variable from the Ubidots API.